Crusader Kings II holds a special place in my heart. Its character and dynasty-focused approach to gameplay provides ample opportunity for each player to experience their own personalized story every time they play the game. It’s also one of the first games that convinced me to switch to Linux full-time, more than five years ago. All of that gushing plainly stated, the various bits of DLC that have come out over the years have been something of a mixed bags. Often too specific, concerning itself with a single religion or area of the map, it’s been hard to recommend most DLC to the vast majority of players. Holy Fury walks away from that specialized approach. This expansion has something for everyone and, in a sense, is a return to the game’s roots. Crusades are the most obvious example of this. 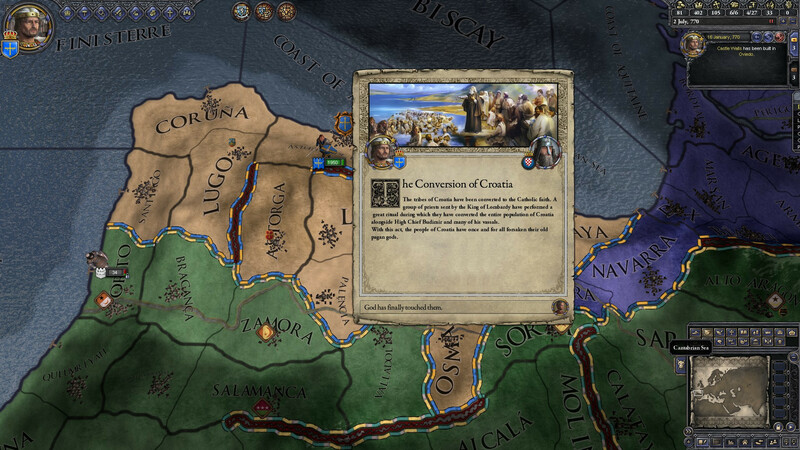 They have gotten a much-needed retrofit with a slew of new events and mechanics for specific conflicts like the Northern Crusasdes or the Reconquista. From what I’ve experienced trying several different start dates and religions is that things are more cohesive, more flavorful and, most importantly, more fun. Events such as attempting mass conversions of pagans, coronation events and getting pious ancestors beatified do a lot to enhance that feeling of immersion that I’ve always appreciated best from this pseudo role-playing game. It’s not just Christians that get all the shiny new toys. Reforming your faith into a modern, resilient religion is made more interesting with the addition of features that can be selected upon reformation. In short, it allows players to customize their faith in the way they prefer such as having autonomous religious heads or enabling polygamy or how aggressive it is at proselytizing. It’s a great system with plenty of variety that, even if you’re not a pagan, can be interesting to interact with. Other additional features, like warrior societies, new portraits and graphics and bloodlines are small, but neat little touches as well. There’s loads of associated events and new situations that you can encounter and even with my obsessive playing over the last few days, I’m sure I haven’t seen all there is to see yet. I can’t complain about any of these new additions, really, save that it may seem like it’s not that much new content if you play only a certain religion in a certain corner of the map. It’s certainly not spread thin but I can see someone who, say, only plays as the Eastern Roman Empire not seeing that much difference save if they decide to delve in Hellenism again. The last major features of this DLC are random and shattered worlds. As the name implies, it’s a game mode whereby the world is randomized with adjustable parameters and you get a different initial state of play. Expect new and different cultures, varying degrees of historical plausibility and a less historically-bound game in either mode. It works quite well and it’s fun to see the world as it could have been or to create something entirely new. Nonetheless, there is a clear novelty factor at work here and I think that the enjoyment a player might get will depend directly on how “close to history” they like playing. Personally, I don’t see myself playing much in either mode regularly, only when I’m bored of the regular setup. Combine that with the already-robust game rules feature, though, and the sky's the limit insofar choice is concerned. As is customary in PDS titles, Holy Fury has come out with a free patch for all players. I know it’s a bit of a cliché at this point but this is a truly massive patch. The UI has been cleaned up and improved and many areas of the game map have been altered, beautified or otherwise rebalanced. I think nearly every part of the large map has been improved. Things like reworked events, flavor events for pregnancies, portrait effects (like freckles, disfigurements and blood) and a wholly revamped set of battle events have made it in. There's plenty of free content to please long-time fans and anyone who might be tempted to jump into the game now. The granular nature of Paradox Development Studios’ DLC policy means that it’s entirely possible to skip something if you’re not interested in it. For example, if you’re never going to play as a Muslim ruler, there’s no reason to get the Sword of Islam DLC. I end most of these review qualifying that your enjoyment will vary depending if you play only in a certain way or in a certain part of the map. This isn’t really the case here and I truly believe Holy Fury is one of the best expansions that Crusader Kings has gotten in a long time. There’s something for everyone and every new system is well thought out and polished. If you’re into Crusasder Kings II, then getting Holy Fury should be an easy decision. Even if you do decide to skip this one for whatever reason, it’s well worth checking out the game again due to all the changes in the free patch. 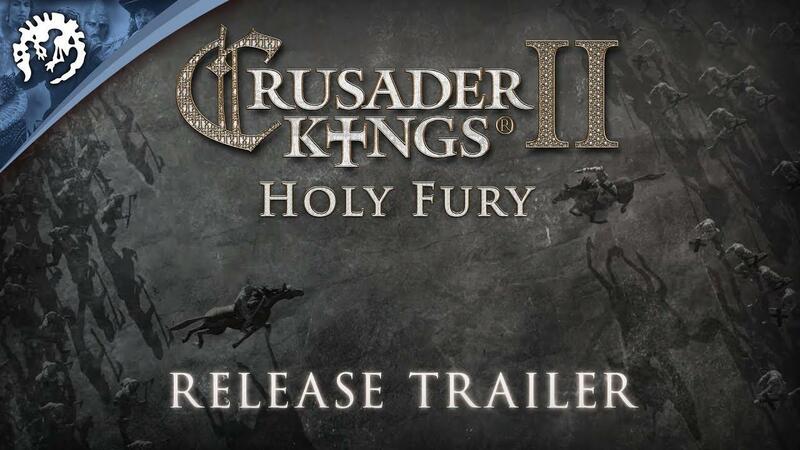 You can get Crusader Kings II: Holy Fury on Paradox’s Webshop, the Humble Store or Steam. I agree that some of the dlc had become a bit niche. This one sounds much more fun. Thanks for the excellent review. Agreed, too. Didn't buy the China one. I am seriously considering buying this one after a couple of months of bug fixing. Holy Fury, huh? Kind of putting the "Crusader" back in "Crusader Kings". Now you can play as animal. I might buy this one, just to play as the Emperor of Blessed Dog Empire. Finaly a DLC that might be worth its money. Btw it's discounted on Greemangaming (as usual). Bought it in GBP, but ended up paying about 14 EUR as opposed to 20 on Steam. Can't wait to try it out tonight. Bonus - no bullsh*t sprite and portrait packs, this time around. Does anyone know exactly how many new provinces got added to the map? I lost count somewhere around the sixth or seventh occurrence of "Added X new provinces to region <Y>" in the changelog, and haven't had time to go back and recount.